If you prefer to pay by cheque or postal order, you can post your order and payment to our company address: Bradcot UK Ltd, Jubilee Way, Thackley Old Road, Shipley, West Yorkshire, BD18 1QG. It's that simple! Once you have decided which product you wish to purchase, you can call our customer service team on 01274 306811. The order line is open 9.00am to 5.00pm Monday to Friday, excluding Bank Holidays. Just quote the product name and Size (if you know it), and we will take your order over the phone. Step 1: Browse our product pages which are split into helpful categories. Step 2: To purchase a product, click on the 'Buy Now' button. You will then be taken to ‘My Basket’ which will show you your purchases. Click on 'continue shopping' to keep browsing the site. When you've made all your choices click the 'checkout' button on the My Basket page. Step 3: Checkout! Our checkout process lets you check and confirm your order, give us separate billing and delivery addresses, and you can pay using Visa, Visa Delta, MasterCard, Solo or Visa Electron through our secure payment facilities. You can still add or remove items right up until your transaction is confirmed. How do I manage my billing, shipping and additional addresses? If you want to amend or add a new address, click on My Account in the navigation at the top of the page and log in. Click on Manage Addresses to the right of address book. If you cannot remember your password, click on My Account on the navigation at the top of the page, log in and then click on ‘forgot your password’. Enter your email address and click submit, we will send you a new password to your email address. How do I log on if I am an existing customer? If you have already registered, click on My Account in the navigation bar at the top of the page. The homepage is the starting point of your online shopping experience. From this page you can browse through our entire range by selecting the product category you're interested in and then clicking on the relevant product. If you want to return to the home page at any time, click on the Bradcot logo at the top of the page. If you require further information about Bradcot or our products please don't hesitate to email info@bradcot-awnings.co.uk or call today on 01274 306811. When you input your credit card details, it's done using the Secure Socket Layer (SSL) encryption method; your details are encrypted before the information goes from your computer to ours. When this is happening you'll see a little padlock symbol at the bottom of the browser or in the address bar - this means that your details are totally safe from prying eyes and that only Bradcot can see them. (Some browsers don't have this symbol; if the address of the web page starts with https, this also confirms you're secure). This method is the recognised standard for secure transactions. We've been using the SSL encryption method since our website went live and have never had any problems with our website's security. However, if you're still unsure, you can call our friendly Customer Services Team on 01274 306811. How long is my product guaranteed? Most of our products are fully guaranteed for a period of 36 months from date of purchase (12 months for Residencia or any model supplied for Seasonal Pitch use). The guarantee is at the discretion of Bradcot UK and does not cover defects arising from accidental damage, misuse or wear and tear, and is available only to the original purchaser. It is offered as an extra benefit and does not affect your consumer statutory rights. For further information and a few tips' go to About Us > Warranty Information. You will be entitled to a replacement, exchange or a full refund. 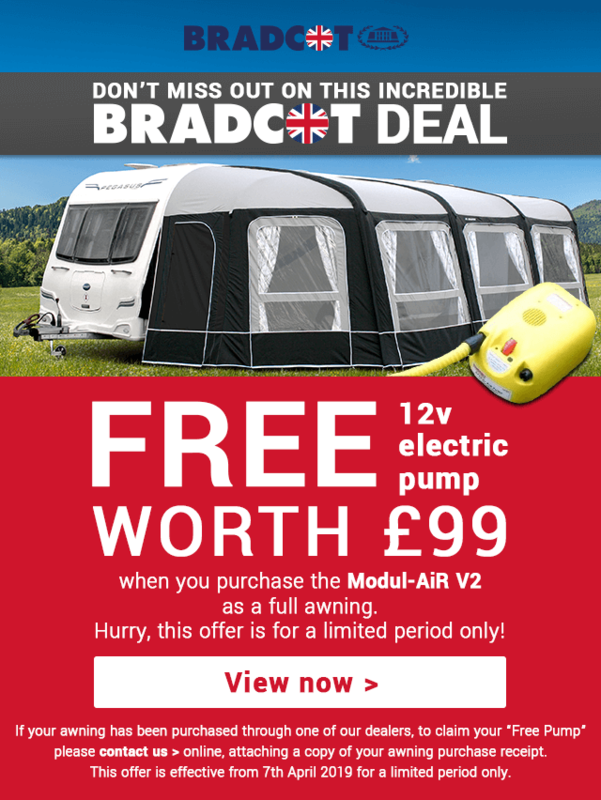 In the first instance, please email info@bradcot-awnings.co.uk who will be happy to advise you. Alternatively, please contact a member of our customer service team on 01274 306811 between 9.00am to 5.00pm Monday to Friday (excluding Bank Holidays). The guarantee is at the discretion of Bradcot UK Ltd. and does not cover defects arising from accidental damage, storm/wind damage, misuse or fair wear and tear, and is available only to the original purchaser. It is offered as an extra benefit and does not affect your consumer statutory rights. Bradcot UK Ltd. reserves the right to improve or alter the specification of its products without notice. What should I do if I have a faulty part or a part is missing? If a part becomes faulty within the 3 years guarantee period, please email our customer services team at info@bradcot-awnings.co.uk and we will be pleased to despatch a replacement part free of charge. Please state where and when the product was purchased and which part needs replacing. Our products are fully guaranteed. In the unlikely event that you are unhappy with your purchase, please refer to our Terms and Conditions, in particular Section 15, or call customer service team on 01274 306811. Please note, we do not refund postage and packing. 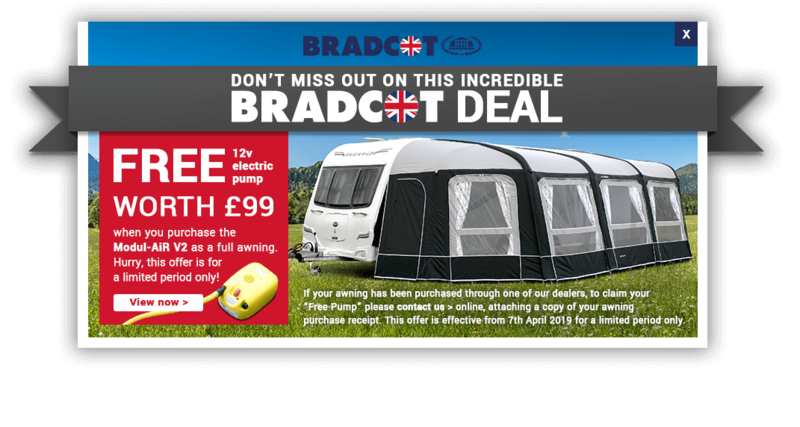 Bradcot Awnings Direct, Unit 8-12 Jubilee Way, Thackley Old Road, SHIPLEY, West Yorkshire, BD18 1QG.